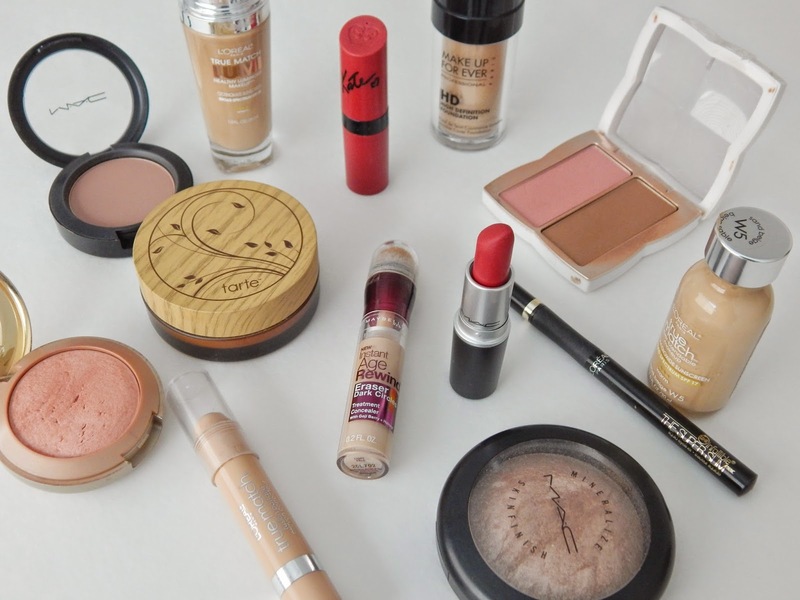 with so many makeup lines out there, it can be overwhelming to determine when it is best to go to a counter or when to go drugstore. while it can be fun to experiment with different options (God knows i do) there does come a point when i can more or less determine where i would rather spend a bit more money on certain products and when i can save. Liquid Foundation- once L'Oreal True Match Foundation appeared on the scene basically all the guess work of 'what is my shade' came out of it. drugstore foundations have come such a long way and are starting to provide vast color ranges that i feel comfortable going drugstore. Powder Foundation- makeup counter. it's not even a question. i have yet to find a good coverage powder foundation with lasting quality from the drugstore. if you know of any, shout it out! Concealer- although i will say my absolute favorite concealer is Benefits Boi-ing (covered all of my acne and acne scars when i was having horrible skin issues) i find that i no longer need it in part because my skin has healed so very much. i now reach for drugstore on this. Favorites include both the liquid and crayon like concealer from the True Match line and of course Maybelline's Instant Age Rewind Concealer. Eyeliner- i only wear liquid eyeliner and for years i was a slave to MAC Bootblack. and then i got a bad batch. and then it flaked and was all over my face. and then i ran to the drugstore to get something quick to fix it. and then began my love affair with L'Oreal Infallible The Super Slim. i have many drug store favorites now as i mentioned here. i really love them all! Mascara- it's not even a question. drugstore. and more specifically L'Oreal Voluminous in Carbon Black. Blush- here i splurge. i feel like you can't beat the color payoff and pigmentation of them. Bronzer- i think it comes down to your skin tone. some bronzers are so orangey and some are so dusty. i think once you find the 'brown' that works for you, then go for it. but to keep with my theme, i go drugstore. Eyeshadow- if i had to pick i would go makeup counter. again it can be hit or miss as with blush or pigmentation and color payoff from the drugstore. so generally i hit up my Sephora for new ones. Lips- my favorite shades are from the drugstore. be it balm, gloss, or straight from the tube lipstick. plus with so many collections coming out all the time, you are sure to find something new. now this isn't to say that i stick to my guns on all of these. how can i provide a true review of various beauty products if i stuck to just one line? this is more or less a guide of when it comes down to it should i choose to spend or save.